Summer can be so many things: as Abel here is discovering, it can be a chance to unwind (and maybe sweat while you’re doing it), take things less seriously (and dress accordingly), get away from it all (while moseying). Like swallows returning to Capistrano (or more likely buzzards coming back to Hinckley, Ohio), summer for me is not official till I see the fireflies at dusk (which, working second shift, can be more evanescent than usual). Deep summer is the constant humming of cicadas, one of the more annoying sounds in nature, especially for someone with my brand of hyperacusis. Soon, the Dog Days of Summer will be upon us: we’ve been lucky this year, here in Central PA, with periods of hot humid weather alternating with cooler drier air (which uncharacteristically seems to be hitting us on the weekends). Of course, the difference for me this summer is, I’m now in a house with Central Air, unlike the first-floor city apartment of yore where you were afraid to leave the windows open at night because it was also Break-In Season (of course now I’m awaiting the Electric Bills of Summer, but that’s another chapter). At the moment, however, for me – but especially for the Big 3, Sieti, Murphy & Max – these are the Cat Days of Summer. The kittens are now three months old which means, figuring out the comparative ages of cats and humans, they are the equivalent of having two-year-old quintuplets loose in the house: welcome to the Terrible 2s (which last, I’m told by parents who have survived children, until they are perhaps 22 and, if not before, out on their own). If I had known they would be such a handful, I would have named them after the Russian Five (not to be confused with another Russian Five...): Nikolai Rimsky-Korsakov, Modeste Mussorgsky, Alexander Borodin, Mily Balakirev and, uhm... oh yes, the one most people have never heard anything by, Cesar Cui, the Little Finger of the Mighty Handful as they’re also known. But those are some pretty stiff names for something as tender as a newborn kitten. For the past week, all five have been out-and-about in the rest of the house. I had kept them “quarantined” in the largest bedroom until I knew they would be safe to introduce to the others (no contagious diseases or parasites), but once they were okay, there’s still the issue of their mother, Frieda Farrell, who, still as feral as she was the day I trapped her in at my apartment, has not yet been tested. If the kittens need to retreat to the safety of their lair, I have to leave the bedroom door open. Since Frieda rarely comes out from under the bed when I’m around, it’s unlikely she’s going to start wandering through the house herself, but the others might go exploring in this room and be very surprised to find another fully adult, fully armed and extremely snarly cat. From the kittens standpoint, these days might be headlined “NEW WORLDS TO EXPLORE.” From the Big 3's standpoint, it varies: “ROME FALLS AFTER BARBARIAN INVASION” Murphy heralds from the kitchen counter, looking down with disdain in between various acts of pissive resistance on my bed (I now do several laundry loads of towels a week); “THE END OF CIVILIZATION AS WE KNOW IT” is probably Max’s constant whining lament; Sieti, lobbying loudly for a very high fence to keep out this wave of undesirable immigrants, spends most of her time hiding on the floor of my bedroom closet or behind the computer desk, hissing like a steam engine ready to explode when any of them get close to her. 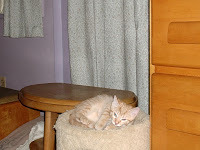 Max has taken to pummeling his scratching post like a boxer working a punching bag. Curiously, Charlie thought this was pretty cool and tried it himself, but he doesn’t look quite as awesome (yet). Max and Murphy sometimes hide in the shelf under the microwave where, for some reason, they seem to be invisible to the horde of furballs romping the length of the kitchen and dining room beneath them. Meanwhile, Charley's preference for a hiding place leaves a little to be desired in terms of general invisibility if not practicality. Having now gone from exploring to playing, they seem most fascinated by the chair that goes with my grandfather’s desk (his graduation present in 1905) and it is not unusual to see all of them engaged in typical kitten games on the seat, between the legs and levitating up to the very top, 4 feet off the floor and advantageous for aerial attacks. The picture (“Commotion in Motion” at left) shows four of them on the chair – you can barely see Blanche the Tortoiseshell getting ready to slide off the seat just as Guy prepares to lunge for the top while Able & Baker tussle on the seat – Charlie is already exploring the desktop. Moments later and before this sluggish camera reset itself, Guy took a flying-squirrel leap to the floor, chasing Blanche out through the kitchen and around the living room. (Nascat would be a good name, too.) Keep in mind, it’s a 67-foot straight shot from my study to the garage door which I think they can do in 3 seconds, now. They all move much faster than my camera can. 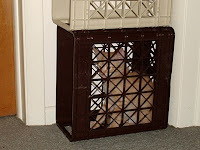 Now, they're fascinated by these little plastic storage crates outside my study door, not that they’re a great place to hide, but they apparently assume they’re too small for any of the Big 3 to get them. Today is a day of anniversaries. Less so that it's the birthday of Marcel Proust, the author of "In Search of Lost Time" (formerly known by the Shakespearean inspired but less apt translation, "Remembrance of Things Past"), born on this date in 1871, than it was the anniversary of my moving back to my home town in 1980, having left the University of Connecticut and New York City behind me. July 10th, I often explained, was the date of "my accident." The plan had been that I would move back to my parents to help with my dad for a while and in the meantime look for a new teaching job before moving on. Instead, I ended up staying, never really finding that job I had planned on, never writing the music I had planned to, nor living the life that had been part of my plan since I was a child. Today is also the anniversary of my father's death. That hadn't been part of the plan, either, at least not then. It's been 22 years now, not a "major"anniversary like 20 or 25, but this is the first time since my mother died that I observe it without her. I didn't really think about it before, but I was talking with my doctor who had also been my mother's doctor and had known my father as a friend and patient, too: he mentioned that he hadn't really taken the time to mourn his own father's death until his mother died a few years later and I'm finding, perhaps, the same sense of a double loss as I go through the house they built together, finding pictures and memories that might not have come to mind in the past 20 years or so. I'm told, in talking to other people, this is not unusual: it is how we are. Our energies become concentrated on the parent that is left. Whether it makes the void larger in the end, I don't know. My focus in the past four months has been my mother, adjusting to life without her; but more and more I realize how much a part of those memories are of "them" and not just "her." And I realize how much more I miss my father that I had been aware of before. Many of the pictures and memories are of my father sitting at the organ or the piano. 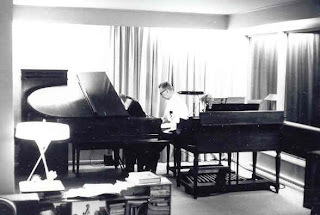 The first photo (above), taken before I was born, shows him playing a little spinet over at a friend's house. 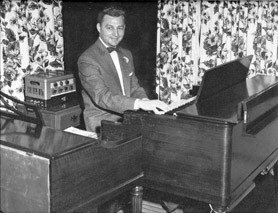 Whenever there was a piano or a Hammond organ in the room, he always gravitated toward it. Friends knew if they were having a party and they invited my mom and dad, they wouldn't have to worry about entertainment because my dad would play for hours. He enjoyed entertaining people and he loved to play. In 1978, when I was playing piano for ballet classes in New York, I wrote to my father how someone asked me to play "Melancholy Baby" and I, for all my classical training, had not a clue, once you got beyond a few bars, how it went. My dad sat down with a list he kept of the songs he could play from memory, collected over the years from the '40s to the '60s, and #1,000 on his list was "Melancholy Baby. " He had perfect pitch which meant if he heard a note he knew which pitch it was -- an A-flat or a C, whatever. They figured this out when he was still in school: the class had already begun singing "Happy Birthday" when he slipped over to the piano to accompany everyone and knew exactly what key they were singing in. It always amazed me to listen to him when I was a kid: he'd hear a song on the radio and could sit down and play it back - not just the tune but all the chords as well. I couldn't figure out why I couldn't do that myself - I still can't, for that matter. He never took lessons, in fact never learned to read music. When I started taking lessons at the age of 6, he would show me a new song he'd gotten the sheet music for but couldn't figure out this one passage: what was that note? how did this phrase go? 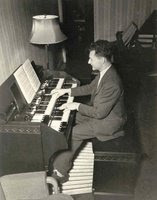 In 1947 (see right) he got his start as a "cocktail organist" playing some nightclubs in town. By 1955, he had a 15-minute radio show live from the Blue Mountain Hotel every Wednesday night (as I recall). I would be allowed to stay up to listen to it. It didn't seem extraordinary to me (I was only 5 or 6 at the time). After all, didn't everybody's dad have their own radio show? I grew up with the Hammond organ and the grand piano in our living room, placed in such a way he could sit on the organ bench, play the harmony on the organ keyboard with his left hand, the bass line on the pedals with his feet and the melody on the piano. My folks built their suburban dreamhome around this combination, the focus of the large living room. The original plans called for a dining room and a living room separated by an archway, but they took out the archway and placed the organ and the piano at the one end, the fireplace at the other end. In this picture, taken in the early-'60s, he was playing the piano. That's a Leslie speaker tone-cabinet behind the piano. In the mid-60s, my dad started having trouble with rheumatoid arthritis and eventually could no longer play the piano which required more strength and stamina than his fingers could manage. When it became clear I was going to pursue music as a career and trying to practice in the middle of the house's activity was not very practical, we sold the piano and I got an upright which we put back in my bedroom. The organ, however, was different, and my dad continued to play it for a few more years, despite how his hands were deformed by the arthritis. When he would go into the hospital, he would play the little spinet piano in the solarium for the other patients after dinner, a nightly sing-along. He had song-sheets printed up and he took requests. Soon the room was full and they had to move it to a larger lounge. It was good therapy for the patients but it was also great for my dad. 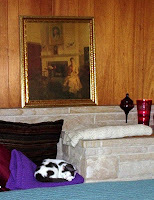 When he was in for a more extended stay, J.H. Troup's, one of the major music stores in town, brought in a Hammond for him to play. But eventually he could no longer play - at least not well enough for his own liking. 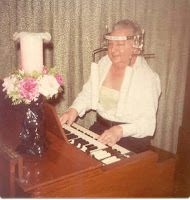 After they became born-again Christians, my parents didn't want to get rid of the organ. They were always praying for the miracle that he would be healed and he'd be playing just like had been before. To sell it now would be an act of bad faith. Even though he could barely walk after a knee replacement, he still would slide over onto the organ bench to play some hymns for their friends who came by for prayer meetings. They often said how they came by to cheer him up and instead left feeling cheered up and blessed themselves. At some point in the mid-70s, there was an accident and he broke his neck, riddled as his bones were with the rheumatoid arthritis. They put this "halo cast" on him to keep his neck immobilized, a steel ring around his head held in place with four screws that went directly into the skull with a brace around his torso. I don't remember how long he was in this contraption but as soon as he was able, he was playing hymns at the organ. By 1979, he was confined to a wheel-chair. In early September, sitting opposite my mother at the kitchen table as they were reading their Bibles together, my dad got a phone call from a friend of theirs who had been led by the Lord to throw a surprise birthday party for my mother who would turn 60 that year. Now of course, he couldn't very well just blurt this out while she's sitting right there, so the guy started naming the months. My dad was sitting there saying "No, no, no, no, no" and then finally "yes." But now they had to get the date and so they did the same thing again as he went down the list, "1st? 2nd? 3rd?" My dad kept saying, "no, no, no..." and eventually "yes" without letting on that it was a little over a week away. My mother was looking at him like "what ARE you talking about?" The friend would make all the plans and do all the calls, but anytime Mom would walk out of the house -- to get the mail, to walk the dog, to make a quick run for groceries -- my dad would get on the phone and call them with more people to invite. It almost didn't happen: they had planned it around a prayer meeting regarding some particular need which, as it turns out, was no longer an issue the day before the meeting -- "an answer to prayer," my mother said but my dad was fretting about how they were going to get her to go for the party, now, without spilling the beans! My mother was not one to go out much, especially considering dealing with Dad and his wheel-chair, but they convinced her to come because it would now be a "thanksgiving meeting for answered prayers." When she got there, it was a complete surprise! I love this photograph, taken just as she wheeled my dad through their door. The look of surprise on her face is one thing, but the look on his face, delighted that they had all managed to pull this off, is priceless. A little more than a month after I moved back from New York, my father had another accident. The doctor said if his bones had been healthy, it would have snapped his spinal cord and he would have died instantly (though of course one could argue if his bones had been healthy, it wouldn't have happened), but because they were porous and fragile from the arthritis, it merely pinched it, causing him to become a quadraplegic in a matter of minutes. It was another five years of constant care at home, during which he regained use of his arms and legs and was able, for a while, to walk again, taking 66 steps on his 65th birthday, with one to grow on before a bad jolt in the wheel-chair broke his tail bone. There were occasional stays in the hospital before he went to the Lebanon Veterans Hospital where he had a series of strokes a month later. One of the horrible things with rheumatoid arthritis is that it won't kill you. He had dealt with this for about the last 21 years of his life. His first visit to the hospital for some kind of treatment for it -- in the days when "gold shots" were the standard form but he was allergic to them -- coincided with my first week in high school: I was 15, he was 46. That, too, certainly wasn't part of the plan. My dad was a typical dad who tried to interest his son in the things he loved. He was disappointed that I didn't want to play baseball -- or even watch it. When I was 6, they took me ("dragged me") to a Phillies game back in the mid-'50s when Richie Ashburn was the big name star of the team and I was so bored out of my mind, I sat there the whole time reading a pile of comic books I'd taken along. I guess they were hoping the excitement of seeing it live - the experience - would win me over. My father loved to fish but I didn't even want to kill the worms, much less the fish. But I loved being outside in nature, wading in the stream, watching the birds, catching newts and crayfish. I didn't always like getting up even before the crack of dawn to get to the good spots before the fish would start biting, but then what teenager would? But when I started to show an interest in music, my father was behind me 200%. He didn't know anything about classical music but he had a few friends who did. My folks found out what that tune was I was listening to all the time on one of my little kids recordings when I was 3 years old and when I was 4 or 5, they got me my first record, an LP of Leonard Bernstein and the New York Philharmonic of Rimsky-Korsakov's "Scheherezade" though it took them a while to find one without a belly dancer's midriff on the cover which they didn't think appropriate for a 5-year-old. I was probably 10 when my dad came home one evening with a book he'd found for me: Rimsky-Korsakov's autobiography, "My Musical Life" which I read from cover to cover. After I had started taking piano lessons, he wanted me to also take "theory" lessons about the language of music, more than just reading the notes but finding out how it works. When he saw me copying out one of the little songs for my lesson -- an exercise in learning notation -- he got all excited because he thought I was actually composing it on the spot. When I really did start to compose my own music a few years later -- certainly by the time I was 10 -- he was there but never pushy or judgmental. I had written a short piece for orchestra when I was in 7th Grade and he told a friend of his who played in the Harrisburg Symphony. So my dad took me into a rehearsal at the old William Penn High School Auditorium to meet the conductor, Edwin McArthur, and hand him the slim score I had completed. When he told us the orchestra would perform the piece on a children's concert, my dad contacted friends he knew at the paper, on the radio, at the TV stations, and we did a round of interviews and photo sessions. It wouldn't have happened without his effort and I know I took it for granted -- this is what you do, this is how it happens. Doesn't every father do something like this for his child? But he never stopped being my biggest fan. 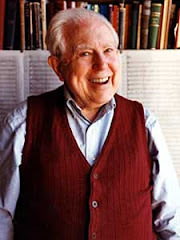 When I had works performed at Susquehanna University, my folks would make the hour's drive up from Harrisburg even though by that time it was difficult for him to walk, much less sit that long in a car. After I conducted a Harrisburg Symphony concert he couldn't attend because by that time he was bedridden at home, my Uncle Bob congratulated me by wishing his daddy could've been there to hear this -- my grandfather, who had died about 4 years earlier, played the trumpet when he was younger and was the member of several bands in the area -- and when I responded in the same tone of voice that I wished my daddy could've been there, too, Paul Beers, a local historian and columnist with the Harrisburg Patriot-News, overheard this and assumed that meant my dad, who was no longer working as an uptown businessman or playing the organ in the clubs any more, must have died So he referred to me in his article as "the son of the late Norm Strawser" which got a number of Dad's friends shook up, since they hadn't heard. Much to their surprise, he answered the phone when they called the house to find out what had happened (Paul wrote a very gracious correction á la Mark Twain in his next column). When it finally did happen, we were all there with him to say good-bye. Though he had on occasion been confused following the strokes -- mostly language things, like nouns not having their accustomed meanings which made it rather difficult to communicate some times -- mentally he was still very good and his faith was still very strong. He had always prayed for healing and it took a great deal of faith not to be discouraged when he wasn't. But at the very end, with minutes left, I realized his eyes were once again the brilliant blue they used to be, not the milky nondescript off-blue they'd been the past 15 years or so, as if that too was a side-effect of the arthiritis or the medication. The healing had begun. And then, his breathing slowing down, he went peacefully and without any apparent additional pain or fear. It struck some people as odd, but we buried him in his red fleece jogging suit rather than the more traditional suit and tie, the kind he had worn most of his life as a businessman or an organist. 21 years later, when we were making arrangements for my mother at the same funeral home, Fackler-Wiedeman, they still remembered that red jogging suit. But his Christian friends who'd come to the house for prayer understood: red was "the blood of the lamb" and when he went to be with the Lord, he would be jogging in heaven. For the past week or so, I haven’t been taking many pictures of the kittens – it’s not that they’re now beyond that “adorable kitten” stage but fortunately, they have stopped growing visibly by the day. Plus, the more active they are, the more difficult it is to get group shots unless, of course, they’re eating, but even then, sometimes, they play musical dishes with the greatest of ease. Speaking of shots, now that they’ve had theirs (at least the first round) and the worm medicine should have cleaned them out (this was a pre-emptive strike, but the vet has known few kittens from a stray mother who wouldn’t’ve had some internal parasites to deal with), it’s time to introduce them to The Big 3. And since Max was the most wary as I tore the bed apart to change the sheets (and at 3am I was beyond pissed), I suspect he’s the culprit. He’s also the only adult male and perhaps knowing there are four young males cordoned off in this otherwise inaccessible room, he may feel the most threatened. He probably does not remember what it was like, six years ago, when I introduced him into the household as a newly adopted stray: the three females then (in addition to Murphy and Sieti, there was also Sieti’s mother, Tobie) accepted him easily enough, but the one had the most difficult time of it was the senior male, an 18-year-old black-and-white cat I’d recently taken in named Keyboard who’d outlived my neighbors. Eventually, Keyboard became less aggressive, Max found less need to assert himself and the apartment (cramped as it was) returned to a reasonably acceptable state of chaos. So this is the first time I’ve had to introduce a new cat to the caboodle – and there are five kittens to introduce, not counting the mother who is still untested and unbowed. Meanwhile, this morning, I managed to get a few portrait shots of some of them. Only once did Charlie sit still long enough for this delayed-reaction camera. Other than the one where he was detained by an especially tempting phone cord, there are two shots of him with the head chopped off as he moved out of range, and several of just blank carpet. Blanche, like me, has found the best placement when dealing with a camera is standing behind the idiot holding the camera, and Baker normally just stays under the bed. So these photos are of Guy (atop the post), Charlie (left) and Abel (below). Not that much else is going on: the back continues to be a problem but at least now I've got a number of bookcases on the way. I ordered a ton through Office Max which should be delivered mid-week, and even though I'm no fan of Martha Stewart, there was a bookcase in her furniture line at the local K-Mart that I really liked and knew would look well in the living room (while the house is not full of antiques in the general sense of the word, just old stuff, this seemed better than the standard style of nondescript bookcase one normally finds these days. There are two small ones in the office at this point, both pretty old, one of which has scribbled on the back where but not when it was purchased: that means it was probably my dad's bookcase when he was a kid, making it about 70-80 years old or so. There's been no composing, unfortunately -- though when a colleague came over to help with the one bookcase yesterday, he mentioned one of his neighbors is a piano tuner who has a small trailer he uses for moving pianos. Wow -- that means I might be able to have him move my upright piano out from the apartment and get my studio set up in the room my mother used for her office (which had been my childhood bedroom)! Hopefully, that will be this week's project. Friday was a big day. The kittens, who turn 10 weeks old on Monday (and that's Charlie and Abel in the picture), had their first collective adventure outside the confines of their known world (i.e., the bedroom they’d branched out into after being born behind the bathroom toilet): catching them and putting them into the two cat carriers was easier than I thought and the trip to the vets was a very quiet one – considering some of the other cats who do not travel well and might be classified screamers, it amazes me that a stray cat's kittens were all quiet if not calm. While they all got their first round of shots (they go back in a month for the rabies shots) and took them graciously, Charlie was a little reluctant to part with any of his blood and therefore ended up with a bandage on his leg that he kept holding out for everyone to see like a little kid (“so cool, check it out”). 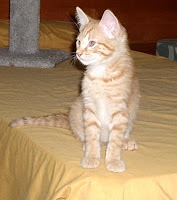 The good news is their blood test came up negative for feline leukemia, a huge relief. The doctor who examined them (one I’ve been going to since 1990 at a clinic I’ve been going to since I was in 6th Grade and we took our pet skunk out to them back in the ‘60s) was amazed they had no visible parasites, especially ringworm (which is surprising when you consider I took Frieda in off the street just two days before they were born and I’d never even thought she might have fleas). 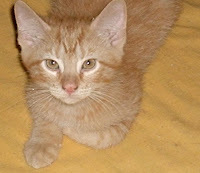 He gave me some internal worming medicine just in case, but flying colors for all five kittens. It will take a tranquilizer gun to get Frieda to the vets, however: I’d already considered calling in one of those “traveling vets,” so that’s next on the to-do list. Not only does she need her shots and to be tested, she’s also getting spayed. But Friday night, while I was sitting in the room after I fed them, Frieda did something she has not done in the 10 weeks since I’d rescued her: she let me see her! At least, when I fed her on my old apartment’s porch, she would let me get a little close to her as long as I didn’t try to touch her. But now, seemingly more feral than she’d been before, she’d rarely slink out from her hiding place (first, behind the toilet where she raised her litter; now, from under the twin beds in the bedroom) and then only to eat as quickly as she could, always attuned to how far away I was (and the farther, the better). She always waited until well after the kittens were done, like a good mother, but this time was different, a little less wary and hurried as if she were savoring the meal, not bolting it like fast food. I sat in the old chair at the other side of the room with Blanche curled up beside me, Guy Noir stretched out on my lap and Charlie on the back of the chair playing with my hair. Then Frieda plopped herself down beside the one bed facing me and rolled over into the Buffet Position. In a flash, Baker and Charlie joined her as did, gradually, Abel and Guy, Blanche only reluctantly giving up the comfort of her chair. 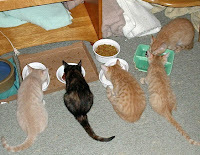 It amazed me that, at 68 days, she would still nurse them (much less have room for all five of them). Soon, there was a mound of slurping and purring and I swear she did it just to prove to me who has the real control over her kittens! When they had finished, they nestled in around her (in this picture, Baker rests behind her, with Blanche in front and Guy beside her; Abel and Charlie were already off and romping) and she stayed there for a good 20 minutes. Even after the others had wandered off to play, she continued stretched out on the carpet, even moving a little closer to me but not too close. It was, in a way, a moment of understanding, perhaps, which I’d waited for for a long time. Ironic that it should happen the same day I’d taken the kittens from her for the first time (they were gone for almost 3 hours) and they must have been full of tales about being poked and handled by other strange people. Or it could just be she’s getting claustrophobic under that damned bed. After all, she’d had the run of the streets of Midtown and was never one to just hang around for lack of anything to do. Being cooped up in this bedroom, as large as it is, must seem like prison. 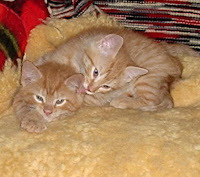 But she was given good grades as a mother by the vets, having raised five healthy and very cute kittens. As she sat there looking at me, she seemed proud of that: I doubt any of the earlier litter she’d had last summer did as well if they survived at all. Meanwhile, things in the garden haven’t been doing as well as I’d hoped. Plants that like “well-drained” soil apparently prefer to commit suicide than just grow not-as-well-as-they-could when transplanted to the rocks and dirt that passes for my yard. The first to go, a variegated bushy plant called “Jacob’s Ladder” reached its last rung after the first week, to be replaced by something called “Angelica” which so far seems to be doing fine. On the other hand, the wooly thyme, a ground-cover herb so durable you can walk on it, turned into a mass of brown in two days. 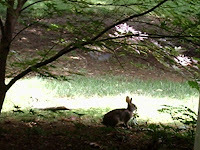 The hoped-for carpet of alyssum seedlings was hoovered up in short order by the rabbits who have found that their fresh tender shoots were preferable to the tough and bitter herbs that comprise most of what passes for a lawn. It's more plantains, dandelions, chicory, wild strawberries (they prefer my neighbor’s cultivated ones, of course) and even the clover and oxalis than real grass. Years ago, Mother and I joked about just getting dozens of containers of wildflower seeds called something like “meadow-in-a-can” (phlox, poppies, cosmos and who knows what all) like somebody we knew had once done, giving up on their patch of dirt otherwise inhospitable to the well-manicured suburban lawn, a modern contrivance that seems to me about as impractical as the necktie in men’s dress codes. But that’s another issue and I digress. Then I discovered the rabbit(s) had mowed down the designer fern with its rich dark emerald-green fronds planted near the back. Do I try peach-basket diplomacy or just bomb the hell out of them? Squirrels might have been the culprits with a yellowish-green sedum that apparently offended their sense of garden decor, so they just kept digging at the center of it until they had uprooted most of it, scattering the broken stems over a two-foot-square area (not exactly how I imagined a ground cover to cover ground). 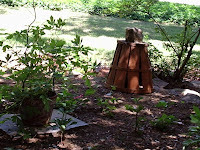 Today, I’ll put the guardian angel out in the garden – it certainly needs one (better, if I could get one that emitted cat-like noises when it senses the nearby presence of rabbits, squirrels and chipmunks, just to scare them off). This little statue seemed appropriate for my mother’s memorial garden because she was always praying for the angels to keep watch over me: a few days before she went to the hospital in February, I had to call home every time after I left work following the Valentine's Day Blizzard so she’d know I was okay, even though she didn’t bother to tell me about all these “breathing spells” she was having. Finding the right angel wasn’t as difficult as I thought, wanting to avoid something too morose like it had just stepped down from a tombstone. The one I found – holding a small bird in its outstretched hands like the sparrow of Matthew 10:29 – was something Mother would have liked herself, a bit of whimsy for being a little different from the stereotypical image but a meaningful one for us both, all the same. 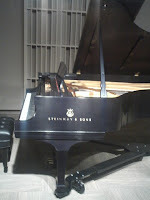 On Thursday night, I had a chance to practice on the WITF Steinway Grand in the recording studio. It was the first time I'd touched a piano in over a month, probably only the fifth time I'd practiced since mid-January. This time, things came back a little quicker, despite stiff fingers and wrong notes. Like physical exercise, it felt good on several levels - especially realizing I could play through some things I haven't worked on in years, especially some Brahms (the G Minor Rhapsody fell together quickly unlike the Schumann Fantasy in C last movement which fell apart even more quickly; Brahms' A Major Intermezzo and his transcription of the Bach D Minor Chaconne for the left hand alone, a good muscle stretcher but only after you're suitably warmed up which I wasn't, really) and some Bach Preludes & Fugues (especially the C-sharp Minor fugue from Book I of the Well-Tempered Clavier, one of my favorites), always good for the soul, too. 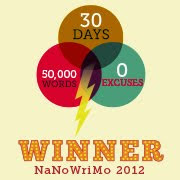 Though only an hour that went by quickly, I felt like I'd run several miles, both exhausted and elated. I look forward to getting my piano out to the house, though I'm still unable to do much in the way of lifting which makes the next stage of the move more of a challenge. I'd seen the doctor on Thursday about the pulled muscle &c and he said it could take six months for it to heal if I let it rest -- that would be November 1st!! I think I overdid it on Saturday, though, going in to pack up and move some more books and CDs as well as some sketches and manuscripts, including my full score of Debussy's Pelleas et Melisande which I want to follow with the recording, part of my summer Debussy Discovery project. One of the things I found, sorting through a shelf-ful of manuscripts, was a set of three short choral pieces I'd written at a fairly down time around Easter 2001 - three short Tenebrae responsories - but never really polished into final shape. As my mother would have pointed out, “there are no coincidences.” I've started working on another set of short choral pieces, some of her favorite Bible verses, which are so far only in the planning stages. I've been listening to a lot of Renaissance polyphony, mostly Josquin des Prez, to get a feel for their continuous textures and seamless flow of the various lines, something my more harmonically oriented style lacks. This time, there are five sections: Romans 8:28; Proverbs 29:25; Ecclesiastes 3:1-8; John 13:34-35; from John 14:1-20.